We are here for you and we won’t be here without you. Thank you for supporting us. Do you have a facebook account? Spend less than a minute to support us by clicking “LIKE” button on our facebook fan page. If you have any comments or concerns, feel free to let us know. We believe that there’s still a room for improvements to better serve you as our respected customers. Click here to go to our facebook page: BE OUR FAN NOW! We aim to provide high quality services for all of our respected customers, and we are pleased to hear that your experience matched our aspirations. All your feedback helps us to continue to improve our services. We welcome all comments, suggestions and feedback from you. A while ago, we have hundreds of our customer pictures uploaded on our previous website but we had lost most of the pictures when we created our new website, http://mybestcardealer.com. However, we were able to find our previous customer album from our old computer, and we uploaded those pictures on our facebook fan page. 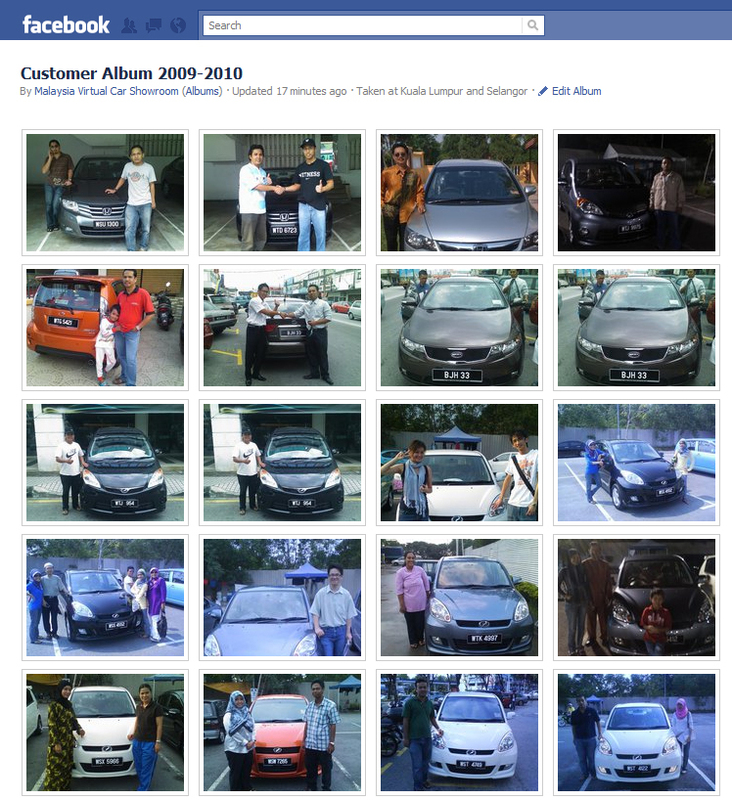 Below are the two links to our customer albums if you would like to see em. Pingback: Your suggestion is highly appreciated! « NSR Motor Traders – Virtual Car Showroom! I found very convenient in your website which need not to browse around. I feel it’s good additionally with your info also 90% complete for us as reference. P/s: If you need further assistance, you can just shoot us an email. This site is providing me a lot of publicly useful information. I would like to thank NSR team. Prompt reply from admin when question asked and good offers information and valuable website info to refers to. Thank you Sir! We appreciate it! website yang sungguh informatif. deffinately will use it to buy my first car when its time. Thank you for your comment and feel free to contact us if you need further assistance. We look forward to working with you in the near future. hai….saya rancang mahu pakai viva 1.0 ataupun saga FL dengan gaji basic sekitar 1400 (belum tolak epf@socso). saya baru kerja 3 bulan di tempat swasta. boleh tak saya dapat full loan untuk 7 tahun atau 9, zero downpayment, and dapat bayaran bulanan dalam sekitar RM350 ke bawah? Bagi case ini, pihak kami cadangkan untuk menggunakan grad scheme dan lebih elok untuk saudara mendapatkan dokumen penjamin, sama ada bapa atau ibu bagi mendapatkan kelulusan dengan lebih cepat dan mudah. Hubungi saya di 019-3559448 untuk membuat sebarang tempahan. hai im planing to by vios G limited. i was wondering can i get full loan.my salary is RM2000. TQ. Hi maran, based on your salary, maximum loan could go up to RM 50,000. If you are interested to get a brand new toyota vios, model J is the perfect choice, but you need to have a guarantor. Saya dari sarawak. Adakah sama interest rate? Dapatkah saya dear dengan awak? Hi, kami kurang pasti dengan interest rate di kawasan you. Hi. I’m planning to buy a car. Can u suggest which is best between preve, Nissan almera or vios? is there any other new model launching by Toyota? Hi Munes, of course Toyota Vios is much better. It has better performance, great fuel efficiency. Hi there, if you are under AKPK, you are not able to apply for any loan. may i know where is your office? is there any where near to sungai buloh or kota damansara? Planning to buy Jazz or Vios.